Activision’s Call of Duty franchise has never had a line of figures, but that changes right now. McFarlane Toys has announced series one will include Ghost and Soap, and hit retail this fall. 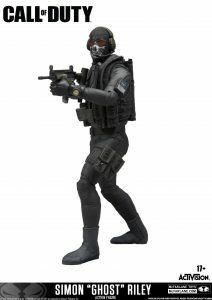 “The cool thing that we’re particularly excited about is how these collectible figures tap into the great characters, who we all know and love from Call of Duty. This franchise has delivered incredible experiences full of iconic and memorable characters, and we’re delighted to bring these characters to life as collectibles to fans,” said Todd McFarlane Owner and CEO of McFarlane Toys. For the uninitiated, calling McFarlane Toys figures ‘action figures’ isn’t really accurate. In fact, you’ll notice that Todd himself referred to the product as “collectible figures”. McFarlane usually produces hyper-detailed, and well-sculpted, figures. But they’re not all that poseable. Unlike some lines that pride themselves on the action, McFarlane prides itself on the figures part of the equation. That’s not to say that they aren’t cool. It’s just that these figures are more mini-statue than toy. Though that’s not really a bad thing when you’re talking about Call of Duty. Certainly a more mature property, Activision’s baby seems the perfect IP to join other McFarlane licenses like Gears of War. CoD’s first wave of figures looks pretty great too. It will consist of two extremely realistic-looking military men. Nope, no cyborgs or exo-suites here (not yet anyway), the initial installment of Call of Duty’s figures will include Soap and Ghost. 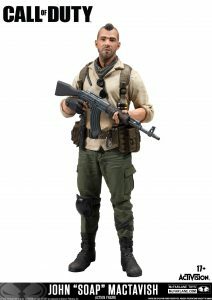 The first wave of hyper-realistic Call of Duty collectible figures will include fully articulated, fan favorite characters, including the iconic John “Soap” MacTavish and Simon “Ghost” Riley from the famed Call of Duty: Modern Warfaretitles, with more characters spanning the franchise to be revealed at a later date. Call of Duty collectible figures will be hitting major retailers in the fall retailing at 19.99 USD. Previous Nintendo Download: The Witch is Back … and Now on the Go!